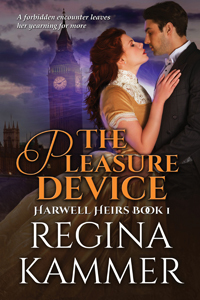 Harwell Heirs series, Book OneIn Victorian London of 1879, a new device for the treatment of hysteria has just arrived from France. Dr. Julius Christopher plans to use the invention for his own salacious scheme. Can Dr. Nicholas Ramsay prevent his beloved, the virginal debutante Helena Phillips, from being the next patient? Copyright ©Regina KammerAs she strode toward the wingback Helena thought the empty bedroom was oddly humid, the windows peculiarly cast in a dissipating haze of steam. Then she felt a presence. A man’s presence. She stopped short. It was him. Her heart leapt to her throat. She watched as he ran to the door and locked it. “Because you’re in here?” she asked plainly. “Well, yes.” He raked his hand through his hair nervously. “And what are you doing on the third floor anyway?” he scolded. “Oh.” She should have been completely scandalized by such a notion, but she was far more enthralled that such things happened at formal occasions. “One what?” he asked distractedly, reconsidering the window. “An illicit love affair.” She relished saying the words aloud. She could never talk like that in front of anyone but Nicholas. “Was it wonderful?” she asked eagerly. “Oh, how romantic!” She wandered over to the wingback and flopped down into it, his gloves falling from the arm to her lap. “I wish I could do something so wicked,” she lamented, smoothing and straightening the kid leather. It simply was not fair that others could be so free. “No,” he responded brusquely. He slipped off his braces and offered the hem of his shirt. “Please, use this,” he said gently. She wiped her eyes and her nose, pulling the shirt up as she did so, revealing his torso little by little until she had completely forgotten about her tears and was simply staring at his stomach. She had never seen a man unclothed before and the sight was affecting her in an unexpectedly physical way. “May I touch you?” she asked quietly, unable to quell the awe in her voice. “Yes,” he said with a yearning quiver.